Located in The Four Corners area of Polk County just 7 miles/15 minutes drive from the Walt Disney World Resort, Regal Palms overall design incorporates a 2 acre tropical swimming pool complex with 2 large heated pools, (yes, heated pools! ), heated water slide, heated Lazy River, heated Jacuzzi/spa (as hot as a bath!) & waterfalls. Warm enough to swim in all year round! There are also extensive sun bathing terraces to relax on under the Florida Sunshine and an outdoor children's play area along with the recently constructed Banana Jacks children's games room and fun house. The Clubhouse features a convenient on-site 24 hour/7 day per week Reception & check-in desk, and includes a large restaurant, with terrace service onto the poolside patio,sports bar with cable TV . There is live music most Friday & Saturday nights, Karaoke on Thursday nights & entertainment most days (in the season). In addition there is a games room with pool table, air hockey table, and a dozen other video games, & high speed internet cafe with 4 workstations and broadband wireless internet connection for laptop computers. We do also have high speed wi-fi in the unit! PLEASE DO SHORTLIST THIS ONE FOR YOUR VACATION MAGIC. YOUR OWN FANTASTIC PROPERTY WITH ALL THE BENEFITS OF A HOTEL WITHOUT THE COST....CHECK IT OUT !! Our property is one of the largest unis on the complex..1856sq feet.. and is located within minutes of the facilities and main reception, and has panoramic views of the Florida country side at the rear. We are an END UNIT and have Free-Wifi INTERNET ACCESS IN THE HOUSE. There are two masters, both with king beds, both with en-suite...one has a furnished balcony overlooking the open aspect and an extra large bathtub. ( and a safe...available on request).There are two twin rooms sharing a family bathroom . We have cable, SMART HDTVs and DVD. There is a fully fitted kitchen with dishwasher, cooker, fridge/freezer...ice maker , microwave and enough crocs for 8 persons. There is a breakfast table in the kitchen and a more formal dining area with large table. There are laundry facilities...washer/dryer/iron/ironing board. All bed-linen and towels are provided for use in the house. There is a patio with furniture, again overlooking the open views.The facilities on Regal Palms are excellent and the prestigious Highlands Reserve Golf Club is across the road. The complex is within walking distance of a supermarket and shops and a selection of eateries.The furnishings are lovely and the house is truly a home away from home.We are confident that you will be pleased with the accommodation...(.and just to let you know the whole house is sprayed regularly to prevent bugs !!!) A SUPERB PLACE TO STAY TO COMPLETE THE MAGIC OF YOUR ORLANDO EXPERIENCE. Hey there, we are a Mother and Son team who own our lovely property in Florida together. I am Terez (The Mother) and my son is Tom. We are both from, and currently living in England. My occupation is as a School teacher and my son is an Airline Pilot. It will usually be me that you talk to when enquiring about our house! Together with our on site property management company, we endeavour to do our very best to facilitate any requests you may have and genuinely hope you enjoy your stay in our home from home, and have a fantastic vacation! 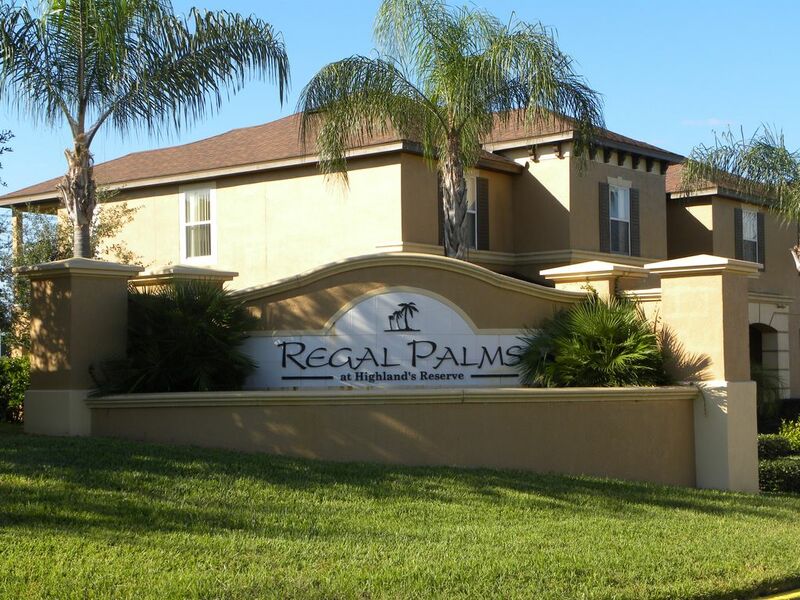 We chose to buy our vacation property here at Regal Palms in Davenport, FL. Plain and simply because we love Florida, and the USA. We are close enough to be able to easily visit all the Central Floridian attractions when we come over, yet the community of Regal Palms provides us with a sense of seclusion and 'time away from it all' that can be refreshing after all the hustle and bustle. Based at Regal Palms you will experience one of the biggest units on the development, and one of the nicely furnished interiors. Open plan downstairs living and well sized bedrooms with an ample selection of bathrooms. The property doesn't back onto other properties, but onto wide open fields providing for a beautiful view to drink your orange juice to on the patio in the Florida morning sun. This also helps to escape that 'rat race' feeling - yet still being close enough to all the community resources - bar, pool, gym etc. Off the front of my wonderful vacation home you are surrounded by other homes on the Regal Palms resort, and just a short 5 minute walk from the club facilities and water pool play areas. Off the back of my wonderful vacation home you are situated by a wooded nature reserve area. This is a rare feature for many of the homes at Regal Palms Resort. We had a wonderful time. Beautiful condo, we had everything we needed. Very nice room with plenty of space. Resort workers were very rude and difficult to get along with. A little confusing getting in and had no code or keys to get in so I had to call the management. Access instructions (including code) were contained within a pdf file sent through the VRBO internal communications. I’m sorry this was missed. I have personally never experienced any rudeness from the staff at the resort but will forward on your feedback to them. Our family had a wonderful vacation at Regal Pines. The home was spacious, easily accommodating our family of 7 adults . It was equipped with everything we needed for our stay and the location in the back of the resort was very quiet. The resort was great--loved the pool and the spa. It didn't hurt that the weather was fabulous. The location was perfect for us, although the primary purpose of our trip was spring softball, not the parks. That said, the parks were an easy drive. Hoping to come back next spring and will definitely look into renting again. The place had what we needed and was very well spacious. Access was easy. The pool area was beautiful, dispite the place allowing balls to be thrown while you swam or went in the lazy river, at one point a little girl was hit due to kids being aloud to throw balls in the pool area. The area overall is quiet and beautiful we would definitely come back again. Glad you had a lovely time Dorothy, we would welcome you back anytime! Perfect guests. First the positives: For our family, the space / size of the condo was most definitely adequate. We did not feel cramped as we would if we opted to stay in a smaller condo or hotel. The price was right, although I was surprised at the additional fees that were collected at the registration desk upon check in. Very close to Publix and great little fish and chips place in the same strip mall. We did not do Disney but it was an easy drive to The Disney properties and Universal. The clubhouse / pool / gym was great (jacuzzi was broken when we were there, however).. The food in the restaurant was decent! A couple of things to note: Wifi password would not work. There are 3 different passwords throughout the documents - one on the wall next to the front door, 1 in the info book (which could really use updating or additional info) and one on the router. With two young children ripping through data and not being able to connect for the first two days, that was a bummer. We ended up rebooting the router when we hadn't heard back from the owner and that seemed to do the trick. One of the televisions in the upstairs bedroom did not work at all. The knob to the closet that housed the washer and dryer came off right away when we opened the closet to throw towels in the dryer. Two of the burners on the stove did not work at all. There was a huge hornets nest by the front door (again, with the kids ... they were freaking out) and one off the upstairs master balcony. Carpets look a little worn out. Our last night there the temperature was dropping to the low forties and the A/C unit would not turn off. We tried to kick on the heat because the temp had dropped to 63 in the house and we were all freezing which caused the smoke alarms to go off! Overall, we really just needed a place to rest our heads at night, and it was a safe, clean community with beautiful facilities. I would stay again but it would be nice to see these items addressed for future guests. Within easy access of Disney and other Theme Parks and all that Orlando has to offer !! !